There are several ways of increasing your site performance. They can be divided into two categories: server optimizations (changing server configuration, installing third-party software) and software optimizations (code optimization, tasks distribution). We recommend using Nginx + eAccelerator for server optimization and use CDN (Cloud Files) for software optimization and better website performance as result. Nginx according to Wikipedia is: a lightweight, high-performance Web server/reverse proxy and e-mail (IMAP/POP3) proxy, licensed under a BSD-like license. It runs on UNIX, GNU/Linux, BSD variants, Mac OS X, Solaris, and Microsoft Windows. Even though 60% of the world’s web sites are powered by Apache, Nginx is becoming more and more popular alternative, mostly because it is able to serve more requests per second with less server resources because of its architecture. 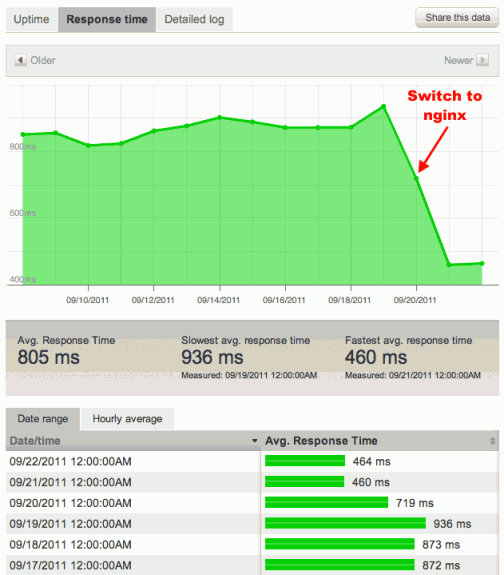 Nginx can handle a large number of concurrent requests quickly with very little overhead. 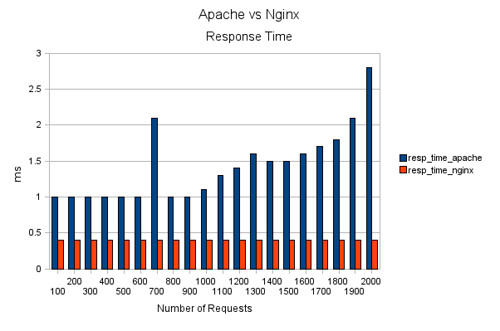 So if Apache uses 4 worker processes (threaded mode), 30% CPU and 17MB of memory to server 6.500 requests per second, Nginx uses just one worker process, 15% CPU and just a megabyte of memory to serve 11.500 requests per second. Also, you can contact your hosting company to get it installed for you. eAccelerator speeds up PHP code execution by caching it in memory. eAccelerator according to Wikipedia is: a PHP accelerator derived from the MMCache extension for the PHP programming language. eAccelerator provides a bytecode cache. eAccelerator is open source and thereby free to use and distribute. eAccelerator stores compiled PHP scripts in shared memory and executes code directly from it. It creates locks only for a short time, while searching for a compiled PHP script in the cache, so one script can be executed simultaneously by several engines. Files that can't fit in shared memory are cached on disk only. 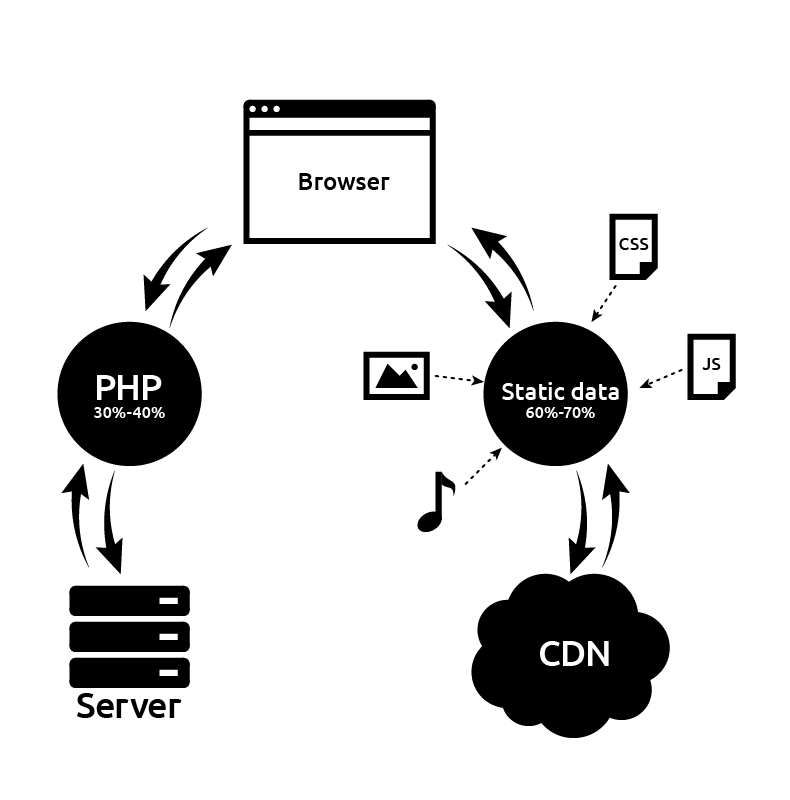 high scalability that allows you saving money and not paying for an additional server to increase your site traffic; faster static content load, which means more satisfied users; lower packets loss and network latency, as a result your static content is delivered to users faster and without losses; CDNs are more reliable as they can still provide high quality static content even with network or hardware outages. Your static content will be available 99.99% as if one server is down, your files will be easily sent to users from other server; less server load as all static files are hosted on other servers.